happy hour indiblogger quickr Quickr NXT - No Fikar, Chat Quickr! Till the late 90’s and the early 2000’s we had something called the classified book named Yellow Pages that contained the list of almost everything. Well that was an offline classified system where the phone numbers and addresses were stored on a fat book that came up with a landline telephone connection. Few years later, online classifieds came into system that made life easier for people. They don’t have to go through the tedious activity of flipping pages. A search on the search bar could retrieve what we actually wanted! One of them was Quickr. Quickr is an online classified portal where you can buy, sell and find things as per your requirement. Few years back, I had to sell a mobile phone. Some friend of mine recommended Quickr to me. I wrote an ad on it and within hours I received many phone calls. Trust me that was a good thing but sadly many times you could get calls at wrong time too. Even after selling your products I would get calls. So there was something that needs to be addressed! Quickr basically has too many categories and each category contains list of useful things. The best thing is that you won’t say that you won’t like it. You could access the Quickr portal from your computer, laptop, tab or a mobile phone. That’s incredible, isn’t it? You could browse through a variety of products - real estates, electronics, jobs, services etc. That would streamline your entire search process! Wouldn’t that be great? The latest feature added to it is the chat facility that enables the buyer and the seller to communicate with each other. Though many ads may be incomplete and could be misleading too and in that case both the parties i.e. the buyer and the seller can talk to each other through the chat messenger and complete the transaction there itself. So if any benefit of doubt could be clarified at that moment. Because no one would like to buy faulty product. With Quickr Next, both the buyers and sellers could immediately connect with each other through the chat across Quickr’s mobile application, mobile site and also the desktop version. It is said that it could change India’s online classifieds as it enables the communicating parties to connect with each other at their convenience and clarify details about the product or service without requiring a single phone call. 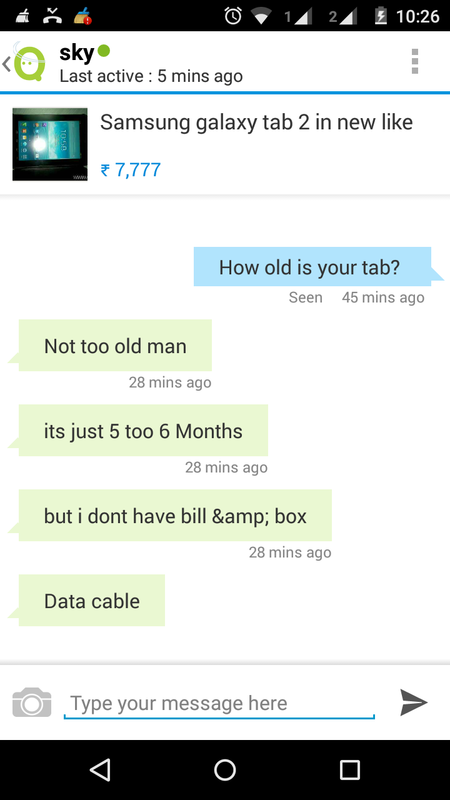 I explored this chat feature by looking for some electronic items. Sharing few screenshots below. Few of the reasons why I feel that chat is better than a call. 1. 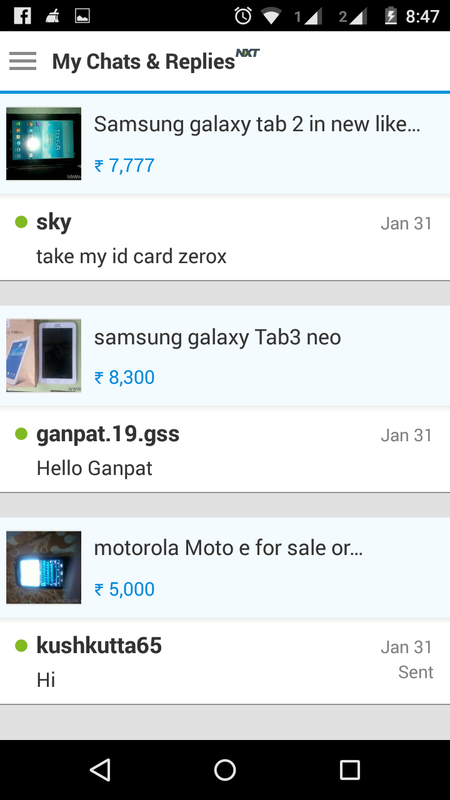 Clarity - Through the chat application you could clarify information about the product or services with the seller. This could be done by sharing instant photographs about the products. So that could help the buyer. There are lots of things that can be clarified on chat over calls. At the time of call you might forget many important things to ask. Through chat you could ask them at any time. So you don’t need to bother the buyer or the seller. 2. Conversation History and Backups - Suppose that you have conversed with too many sellers and it’s your turn to short list one of them. So the chat history of your conversation with most of the sellers are saved in your account. So you could any time go back to the buyer and read the product specifications once again. Isn’t that a great feature? Though it’s a common feature in most chat applications, it is handy in this case. You can re visit the chat and see the photographs, specifications once again. 3. There is a high possibility that the buyer or seller might be busy and at times calling them at a wrong time would be a wrong option. So you could send them a chat messenger and they would reply back whenever they see your chat conversation. So why wait? If you have any unused products you could sell it quicker on Quickr Nxt and that too at a MSP price. So I highly recommend you to make good use of this application for selling and buying stuffs online.